Christmas crackers are a festive staple. They’re surprisingly easy to make yourself though and making them at home means that you can make them very personal. Step one: If you are squeamish about the hygiene of using toilet roll tubes, many people recommend putting them in the microwave on high for 30 seconds. Be careful you don’t burn your hands removing them. Step two: Cut one toilet roll tube in half – these halves will form the cracker ‘pulls’. You then need to perforate the main loo roll around the centre to weaken it so that it breaks fairly easily when pulled. Step three: Lay out a piece of paper (30cm by 30cm should be fine) for a cracker and place the whole tube in the centre, with a gift, joke and party hat inside the tube. Step four: Around 1.5 inches from the main loo roll, place the two loo roll halves at either end of it. Step five: Stick the cracker snap near the centre of the roll, with one end stuck down on either side of the perforation. Step six: Now, slowly and carefully roll the paper around the three tubes. Glue the join once it feels secure. Make sure the gift, hat and joke are still inside the centre tube. Step seven: Now, twist the paper between the roll and the half rolls to make a cracker. You can secure this with ribbon or curling ribbon. Step eight: If there is too much paper hanging over at the ends, tuck it inside the tube and glue or trim it off. Go mad with decorating your cracker – nothing is too overboard for Christmas. Consider Christmassy stickers, glitter, ribbons, little bells – anything festive! You don’t have to use jokes from books or the internet – you could always use poetry, Christmas carols, sayings, proverbs or even a personal message from you. If you’re feeling romantic, proposing with your very own homemade Christmas cracker with an engagement ring inside is a novel way of doing it and bound to catch the attention of your loved one. Give one cracker a try and see how you can improve your technique – although making your own homemade Christmas crackers is easy, it can be a little fiddly and a neat finish makes all the difference. 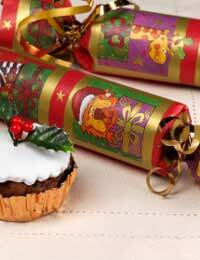 Try to make your Christmas crackers in good time so that they can form part of your Christmas decorations. Use pretty, co-ordinating paper and use them to liven up your Christmas tree and living space. Find out more ways to make great use of cardboard, wrapping and of our course toilet roll tubes at our sister site Green Uses For Waste.